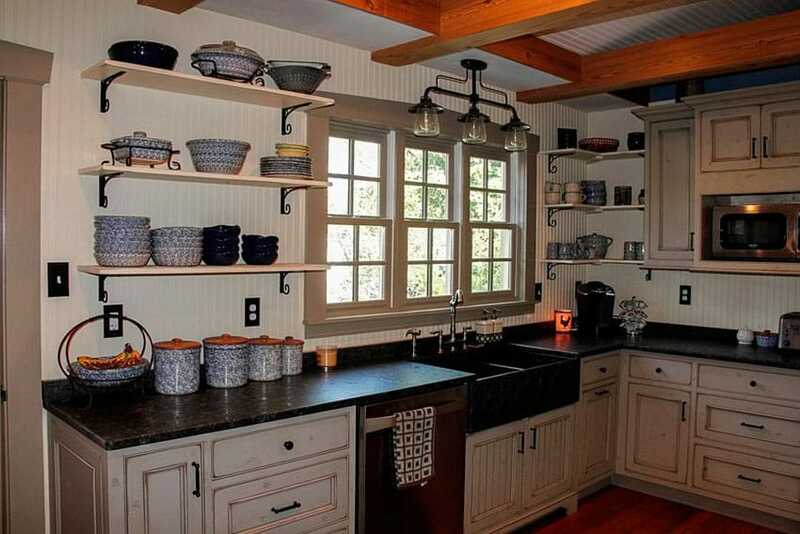 Welcome to our gallery of farmhouse kitchen ideas. 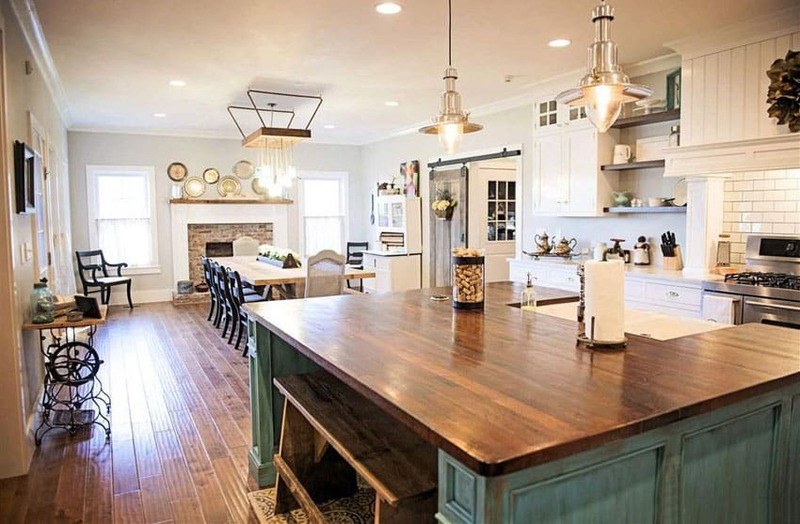 These designs feature a variety of farmhouse kitchens with eat-in dining, shaker cabinets, farmhouse sinks, hardwood flooring, rustic islands and a lot of charm. 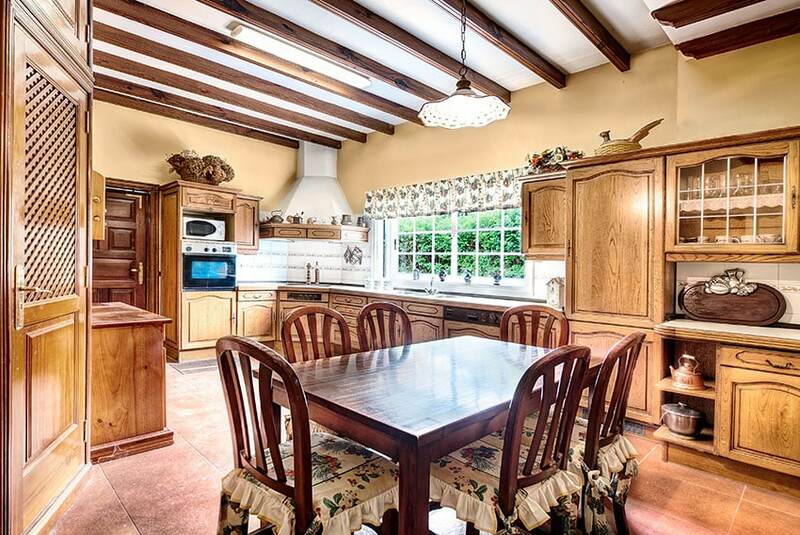 Take a look below to find ideas and inspiration for creating a country inspired kitchen space you’ll love. Black metal figures a lot into the Farmhouse style kitchen above, evidenced in its wireframe pendant lamp trio with filament bulbs, open shelving brackets, and cabinet hardware. The very pale blue paneled cabinets accentuate the reclaimed wood kitchen island countertop. A linear white wall used as the backsplash matches with the frame for the white mullioned windows, adding a clean classic touch. The stainless steel Viking range adds an air of modernity to the Country kitchen. 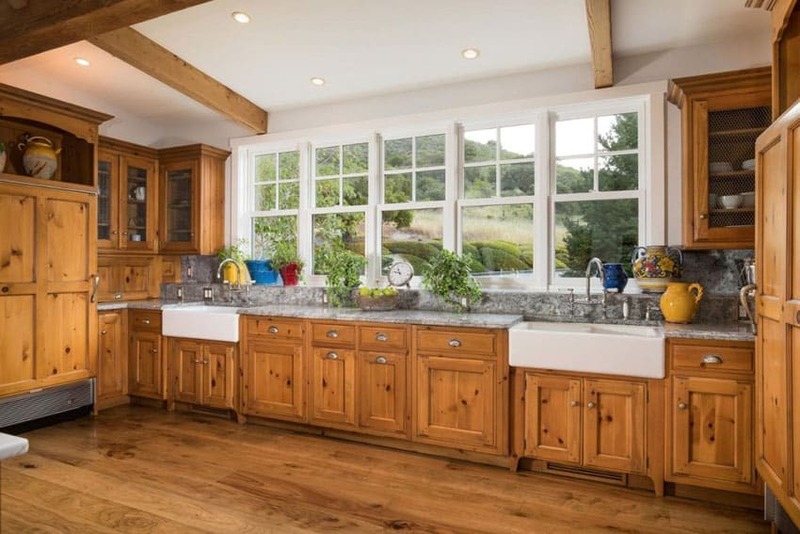 Farmhouse kitchen islands – Known as the workhorse of the kitchen these surfaces are used to cook and prepare food on. In addition, metal, wood or upholstered stools can be pulled up to the island for eat-in dining. 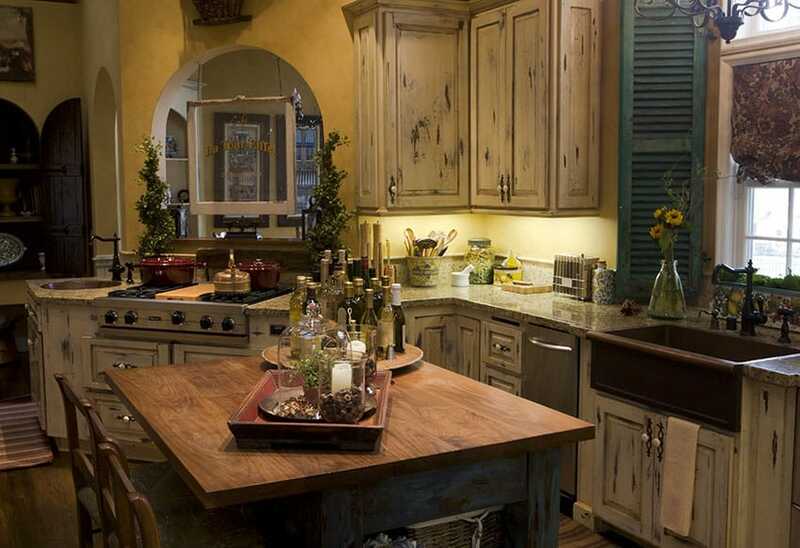 Farmhouse islands are often painted in pastels and warm colors to give a real homey touch to the space. Open shelving and glass door cabinets – Many classic farmhouse kitchens have open wall mounted shelving along with glass door cabinets. One way to incorporate an open shelving style in your home is to remove some of the doors. You can also consider replacing upper cabinets with floating type shelves. These can also be paired with Shaker cabinets which are a popular choice for this style. Farmhouse kitchen sinks – These sinks are big and can be used for a variety of purposes from scrubbing pots, to cleaning clothing and even washing the baby. Also known as an “Apron front sink” they offer a deep basin that sticks out slightly from the surrounding cabinetry. These sinks have risen in popularity over the years and are now highly sought after in traditional and contemporary kitchen designs alike. Butcher block countertops – These wood countertops bring a natural feeling to the kitchen and look great. They are a great way to bring some character to your space, are durable and can be used to provide contrast next to stainless steel appliances. Natural lighting – A light and bright kitchen area can really raise the mood and help one appreciate the rich details of this design. The more natural light you can let in the better you’ll appreciate the bright and cheery environment. Beadboard walls, cabinets and islands – These striped wood panels definitely fit in to the farmhouse style and provide a clean and uncluttered look to your room. 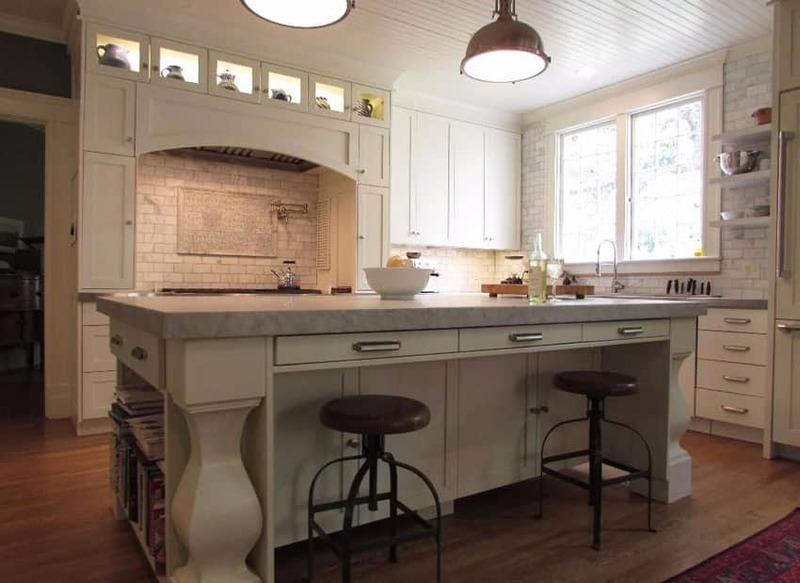 Beadboard can be used on walls, cabinets and islands to give you instant vintage elegance. A pair of unique cast iron candelabra hangs over a matching Calacatta marble-topped kitchen island and breakfast nook supported by heavy wooden legs. Reclaimed wood ceiling beams and a rough wooden header over the Subzero and Wolf stove top and range hood add a rustic quality. The whole Country Rustic look is completed with the sandstone subway tiles for the backsplash, Hickory wood plank floors and cream-colored paneled cabinets. An old Antebellum style pair of wrought iron and glass lamps hangs over a two-tier kitchen island. The higher, larger section is topped with a butcher-block wood counter with a recessed sink and mounted chrome faucet, while the lower section is topped with typhoon Bordeaux granite. 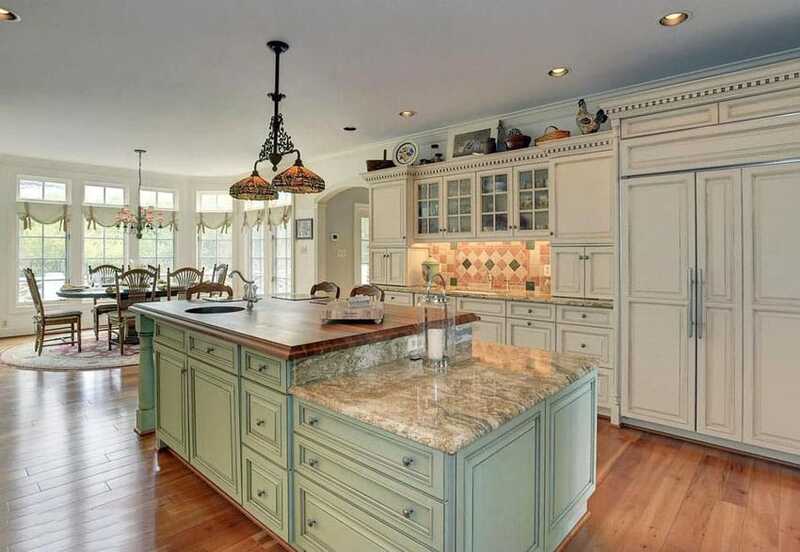 This Southern Country style kitchen is further emphasized with the light green paneled drawers and casework for the kitchen island, and off-white for the rest of the cabinetry. The diagonally installed grey and orange backsplash as well as the warm wood plank flooring add to the homey feel of this kitchen. Combining wood with wood, the wood countertop is supported by a plinth of distressed green wood, which is further accented by the heavy wooden bench and hardwood flooring. The whole room, in white, is matched by the white paneled cabinets at the back and the white ceramic tile backsplash. Two silver pendant lamps with filament bulbs add a touch of Contemporary and contrasts the wooden block with hanging bulbs over the dining table. Taking a darker tone for this country kitchen, the all-white walls, columns and ceiling contrasts the army green kitchen drawers and cabinetry. 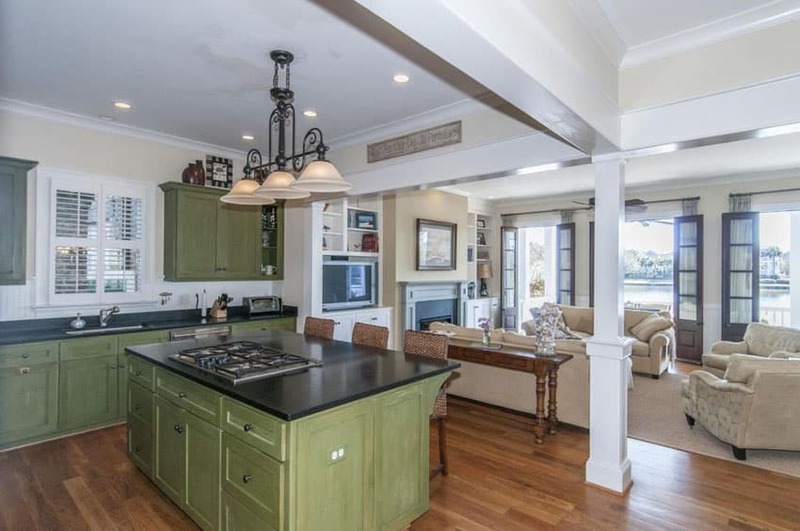 The old Southern style pendant lamp trio hangs above the kitchen island, which is topped with a black granite countertop and a flushed stove top, adding to the dark Southern tones of the kitchen. A thin wooden console table, rattan nook chairs and white vertical backsplash add lighter tones and emphasize the deep green and black of the kitchen. 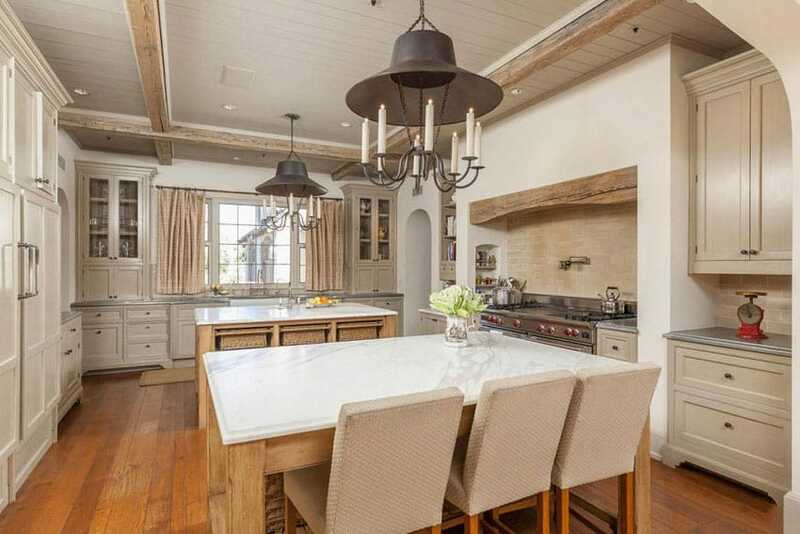 Two large industrial lamps hang from the beadboard ceiling and illuminate the massive marble topped kitchen island, supported by a large white plinth and undercounter shelves. The paneled casework and cabinetry, decked in white, add to the clean look of this white-themed Country kitchen, as does the framed window that brings in ample amounts of daylight. Intricate finishes are provided by the marble subway tiles for the backsplash and the warm wood planks used for the flooring. A rich oak wood breakfast bar is held aloft by white paneled kitchen casework and is paired with dark walnut barstools in a black iron framing. The monochrome combination of white cabinetry and open shelving, and black stone countertop and wash basin, is given life via the pale canary yellow walls. The petite bell-shaped pendant lamps hanging over the breakfast bar and dining table and mullioned French windows leading to the terrace also add some quirky comfort and lightness to this Farmhouse style kitchen. Painted in white, this cathedral ceiling open-style living and kitchen area uses its exposed beams and high ceilings to create a unified space. In contrast to the heavy wood and dark blue upholstery of the living room set, the kitchen stools are in light wood frame and rattan backing. In addition, the white paneled drawers and glass mullioned hanging cabinets add to the lightness the vaulted ceiling creates. The mosaic tile backsplash goes with the linearity of the built-up wood over the range hood, as well as the planks running along the ceiling. 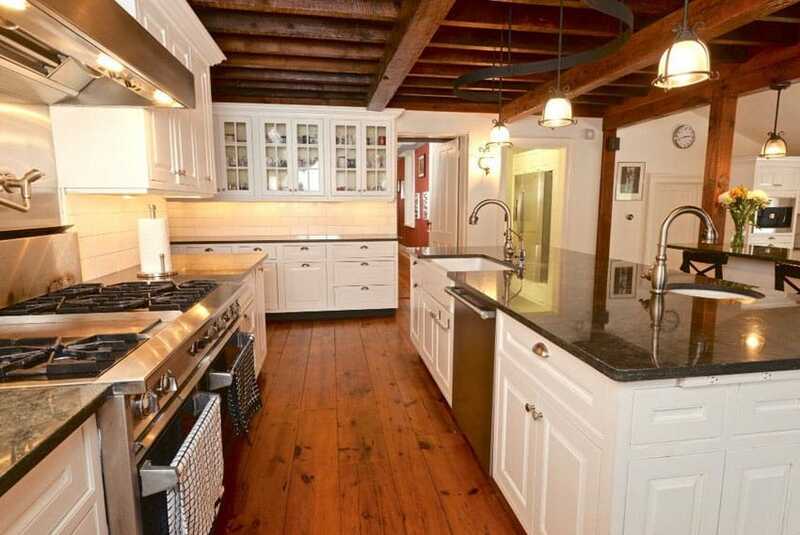 This galley-style or double loaded farmhouse kitchen features white paneled cabinets and a neoclassical plate rail held up by brackets over the range hood. Color is added to the space with the powder blue walls by the dining table, while the farmhouse style earth tones are again emphasized by the sandstone tile backsplash and warm wood strip flooring running the length of the kitchen and dining areas. The brown and white patterned wallpaper matches with the sanded army green kitchen island cabinets, with its earthy tones and busy lines. 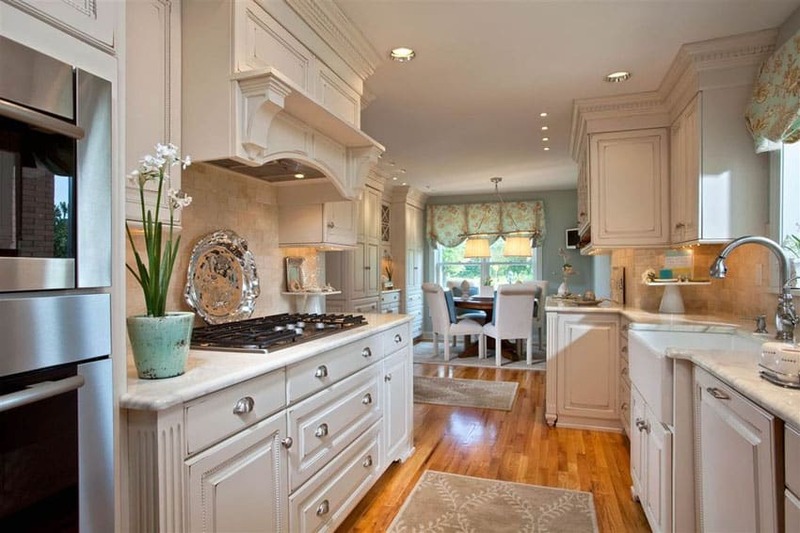 Cream-colored kitchen cabinets and warm wood plank flooring lend cleaner, more classic finishes to this country style kitchen. The trio of old-gilt glass pendant lamps over the kitchen island unites the whole kitchen and gives it a more luxurious feel. Red oak wood flooring contrasts with the powder blue kitchen island casework, while the glass used for the cabinets allow users to see the cabinet’s contents. The pale blue theme is continued on the walls and on the décor above the hanging cabinet’s plate rail. 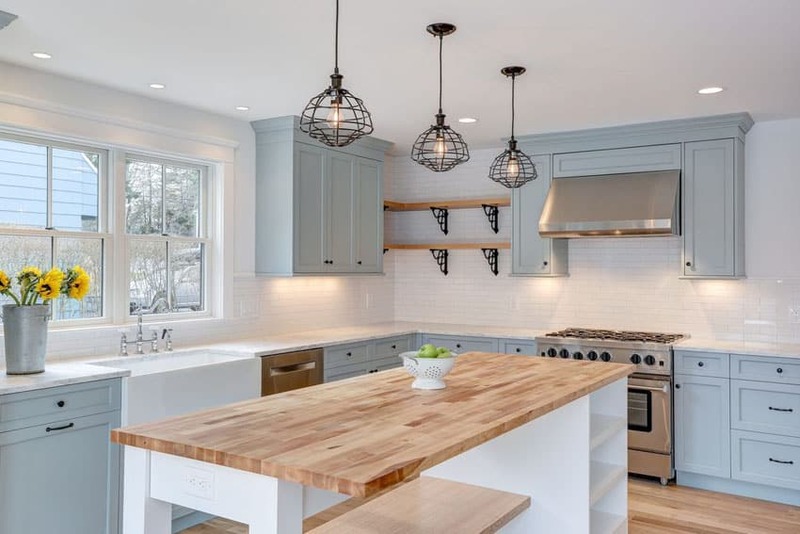 To counterbalance the cool tones of the pale blue and warm tones of the red wood, the rest of the kitchen cabinetry, doors and cornices and backasplash tiles are in white, as well as the double level breakfast bar’s countertop. Modernity is evident in the kitchen via the stainless steel oven recessed into the casework and the hanging pan hanger with lamps over the kitchen island. A heavy, free-standing rustic wood island with a lower open shelf is topped with a black iron pot rack, which quickly gives a rustic feel to this Farmhouse kitchen. The square ceramic tiles in white and brushed bronze backsplash also add to the rustic feel, while the light green paneled cabinetry gives the kitchen a light, bright accent. An arched architrave leading to the stairs and hall gives this kitchen a unique identity, differentiating it from the rest of the house. An Iguazu granite countertop is accented by the curved brass glass lamp trio hanging above it. 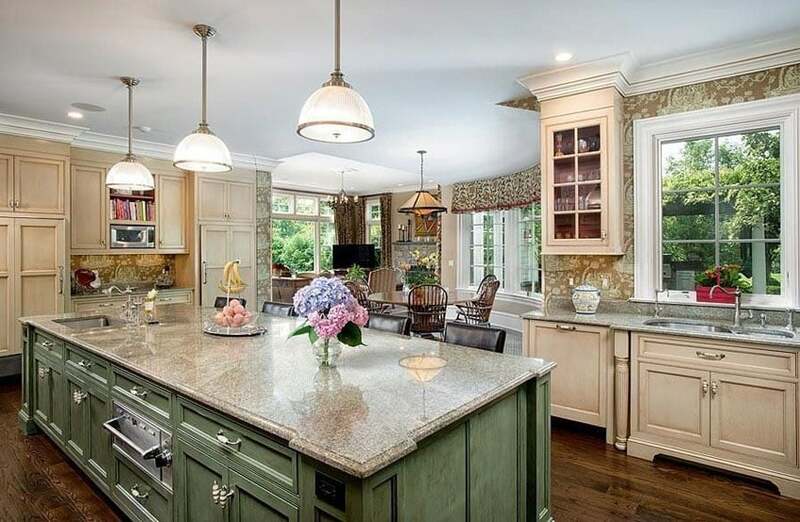 The kitchen island is carried by a cream colored plinth and casework, and is matched by the white raised panel undercounter drawers and hanging cabinets. The earthy tones of the mint green walls and sandstone tile floors add to the natural finishes used in this farmhouse style kitchen, and is topped with the clean lines of a plain white ceiling. 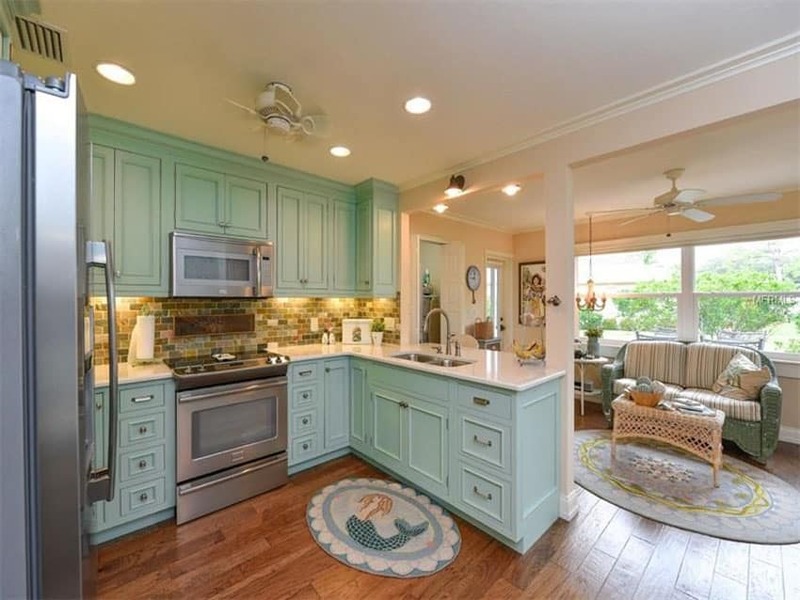 Choosing a quirky color like mint green for this country style kitchen’s cabinetry works because of its seamless combination with the quaint, eccentric furniture like the mermaid rug and pinstriped sofa with rattan frame and coffee table. 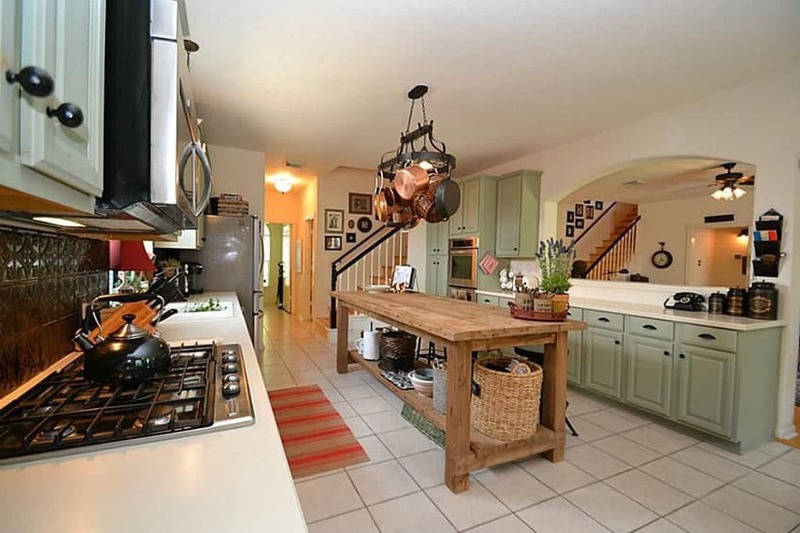 Further accent is added with the multi-colored mosaic tile backsplash, while the white quartz countertops, plain white ceilings and warm wood plank flooring makes the quirky Country look appear more natural. 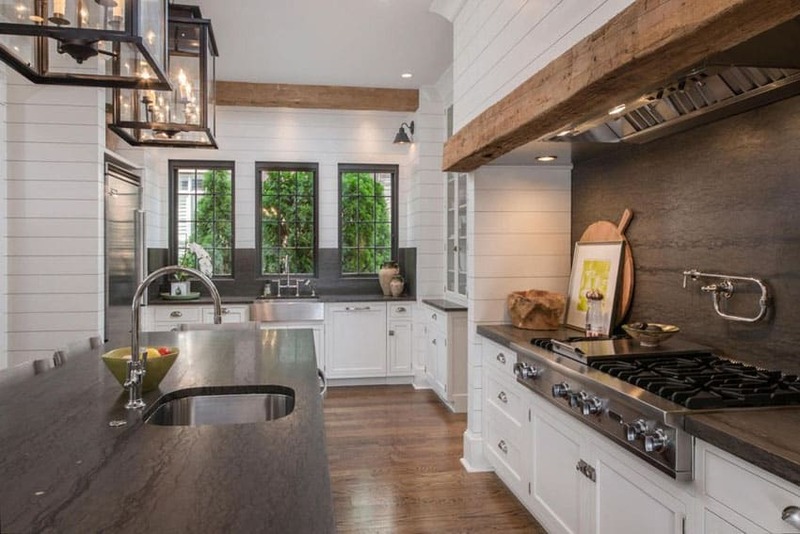 White shiplap boards make up the walls of this Farmhouse kitchen, with the terminations ending with reclaimed wood headers over the range hood and the trio of black mullioned windows behind the stainless steel farmhouse sink. White paneled kitchen cabinets contrast highly with the black soapstone countertops and chrome-finished faucets and stainless steel appliances. 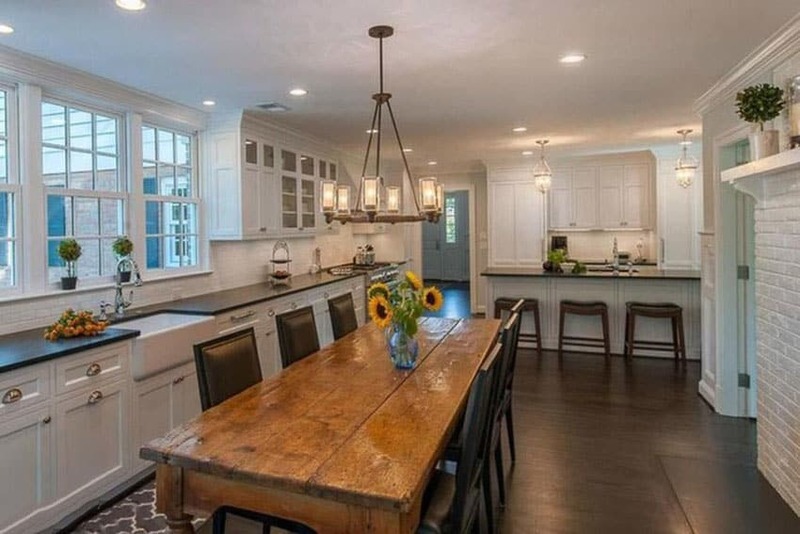 Antique lighting fixtures in black metal and glass hanging over the kitchen island and mounted on the wall by the sink add an industrial chic feel to the country style finishes used in the space. The dark grains of the walnut wood countertop for the kitchen island are emphasized by the blue painted wood undercounter cabinets and plinths. The whole kitchen island set-up is accented by the plain white kitchen cabinets, stainless steel appliances and the pair of white framed double-hanging windows, which bring modernity to the kitchen. The earthy tones are contributed by the brown-grey granite countertops and warm wooden strip flooring. 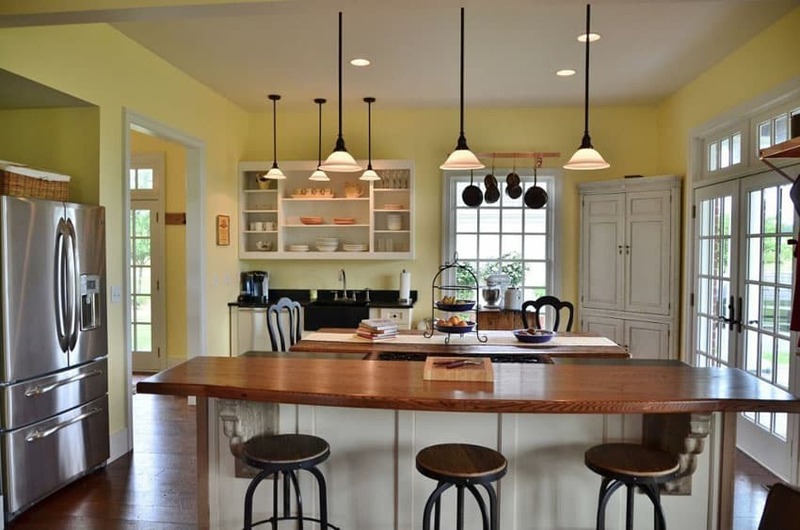 A pair of retro pendant lamps hanging over the kitchen island makes it the main focal point. The reclaimed wood Farmhouse style dining table holds this L-shaped kitchen together, as does the bronze and glass chandelier hanging over it. With a white farmhouse sink, white kitchen walls, mullioned windows and cabinetry, the black countertops stand out and give this rustic kitchen a modern feel. Adding to the lightness of this kitchen are the pair of bell jar pendants over the kitchen island on the far side of the space. 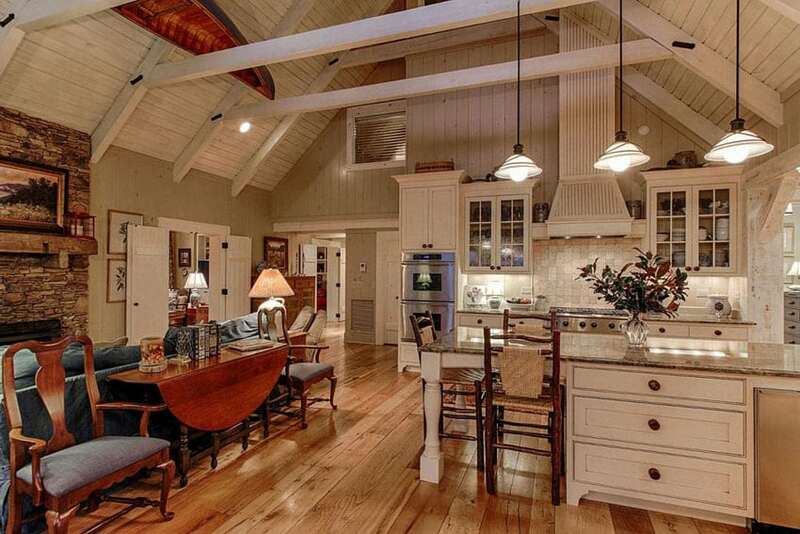 The exposed wood joists and girders on the ceiling is echoed by the wide plank hardwood floors. Black and white elements neutralize the warm wood, with the black metal and glass pendant lamps over the kitchen island and plain white paneled cabinets and drawers. Modern chrome finished faucets serve the bar sink and farmhouse sink, while stainless steel appliances tucked into the blue pearl silver granite countertops provide good functionality. 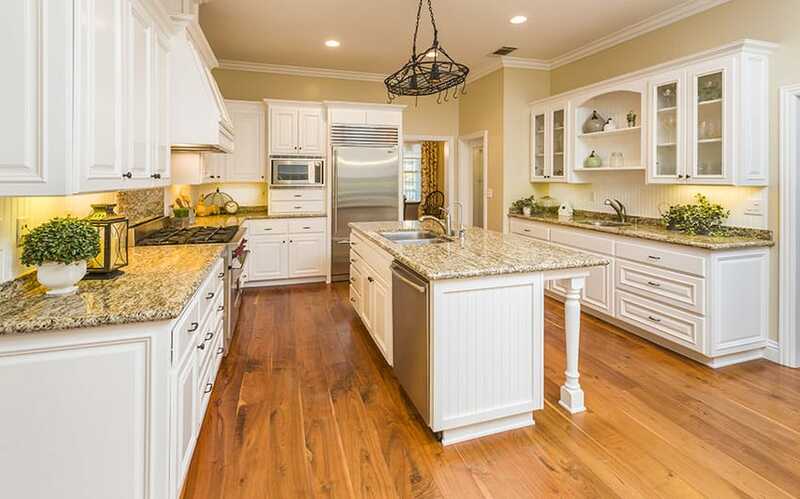 The white paneled cabinetry’s clean lines and bright tones contrast with the knotted warm wood plank flooring and yellow granite countertops. A black iron pot rack over the kitchen island and built-in stainless steel sink and appliances mix antique and modern utility together seamlessly, and is accented by the off-white walls and white cornices. Warm pelmet lighting further adds an air of lightness to this white farmhouse kitchen. Distressed wood cabinetry with aged iron and porcelain handles are brought to life by the bright green window shutters and deep blue wood of the kitchen island. The kitchen island countertop features rich wood planks, while the rest of the cabinetry is imbued with grey speckled stone countertops. A cream yellow tint on the walls brings this farmhouse kitchen unity, and emphasizes the rustic qualities of the copper farmhouse sink under the white mullion window. 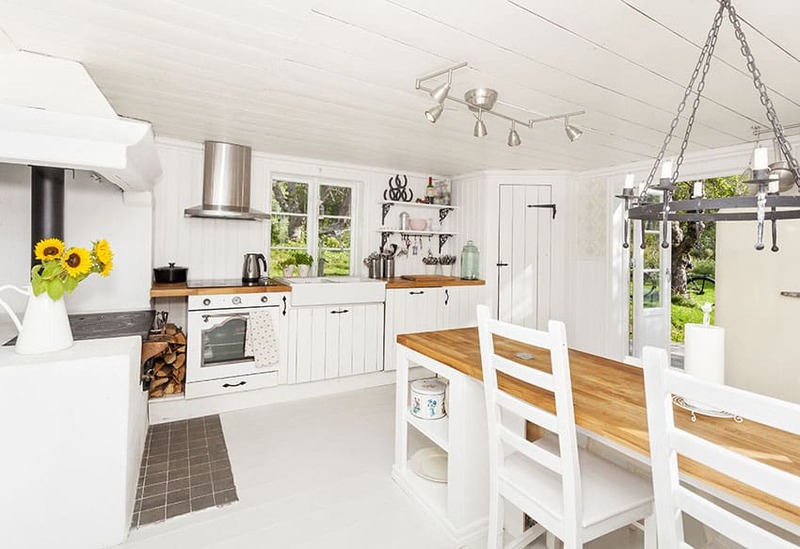 This all-white kitchen with its horizontal white painted plank ceiling and white painted vertical plank cabinetery is given a pop of color with the warm reclaimed wood countertops. The white tiled floor is broken up by a patch of grey tiles by the oven, and the firewood stored beneath the kitchen counters. White French doors and mullion windows brings the greenery of the outside into the kitchen interiors, along with the sunflowers in a pot. Stainless steel fixtures such as the range hood and spotlight set over the kitchen island is contrasted by the black iron door and cabinet hardware, open shelf brackets and antique hanging candelabra. 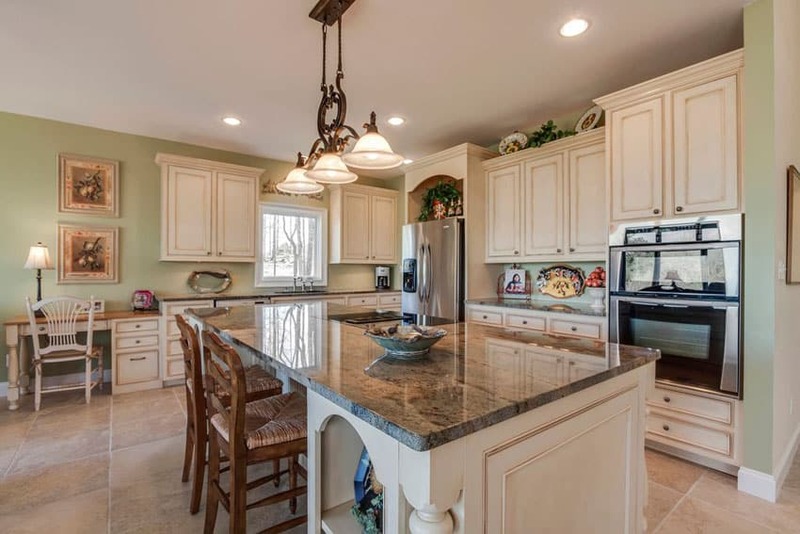 The old distressed green painted wood of the kitchen island is matched by its blizzard granite countertop. 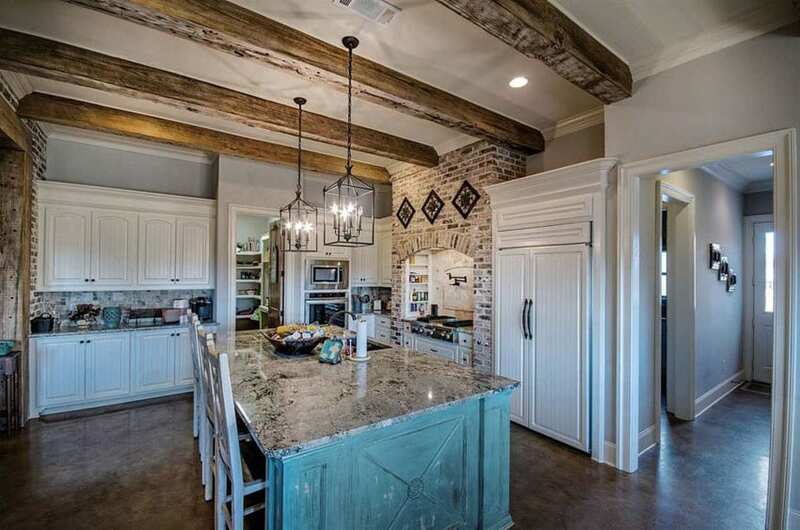 Other rustic elements in the kitchen include the exposed reclaimed wooden beams spanning the width of the kitchen, and the brick backsplash and build-up for the stove top and range hood. The grey walls and white paneled cabinets and pantry provide a clean backdrop to the pair of antique black iron and glass hanging lamps over the kitchen island. The beautiful view outside of the white mullioned windows is brought inside, with the knotty wooden cabinets and exposed reclaimed wood beams used in the ceiling. 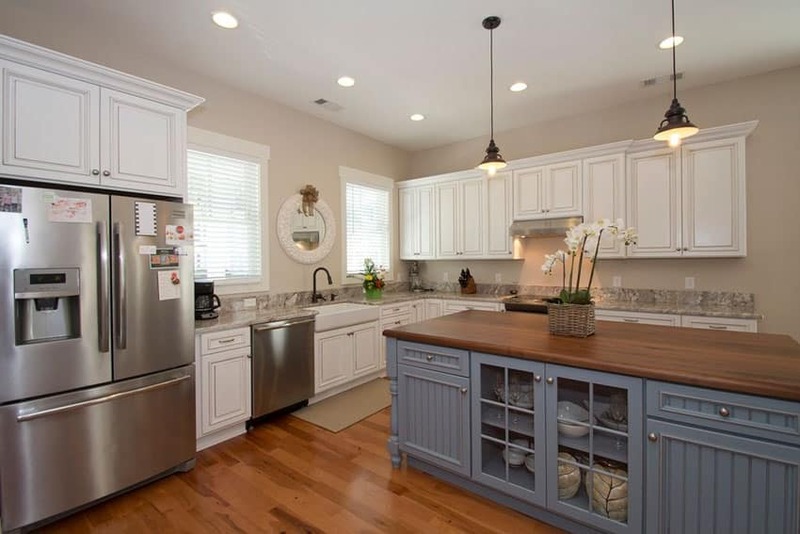 The grey granite countertops and backsplash are broken by the white double farmhouse sinks embedded into the cabinetry. Warm wood plank flooring ties the linear kitchen layout together, and is given clean lines by the chrome-finished cabinet handles and plain white walls and ceilings. The natural tones of the exposed dark wooden beams running along the ceiling’s width is echoed by the dark sandstone tiles on the floor and heavy-grained polished wood cabinetry. Lightness is added to this farmhouse kitchen by adding a large mullioned window over the single basin sink, putting white ceramic tiles as the backsplash, and painting the range hood white. The quirky teapots decorating the plate rail over the range hood matches with the flowery pendant lamp over the solid wood dining table. The homey country house comfort is also shown by the matching upholstery on the dining table chairs and valance curtain over the mullioned window. The black stone countertop blends seamlessly with the black farmhouse sink, and is emphasized by the white paneled cabinetry with rustic black metal handles. Exposed wood beams on the linear white wood strip ceiling add warmth to the black and white kitchen, and matches the wooden floor planks. Rustic accents such as the wrought iron brackets for the white open shelves and the triple bell jar pendant lamp over the sink add rustic accents to this Farmhouse kitchen. 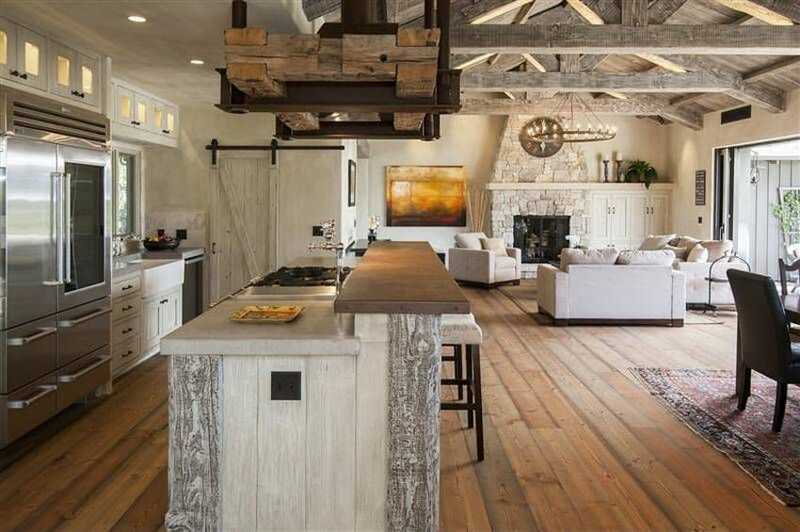 This rustic cottage style house with its exposed wooden beams in its cathedral ceiling and split face stone fireplace is matched with even more rustic elements such as the sliding barn door in white wood and black metal hardware. The reclaimed white wood kitchen island is topped with a white single basin farmhouse sink and a double-tier of white stone countertop and black stone counter. 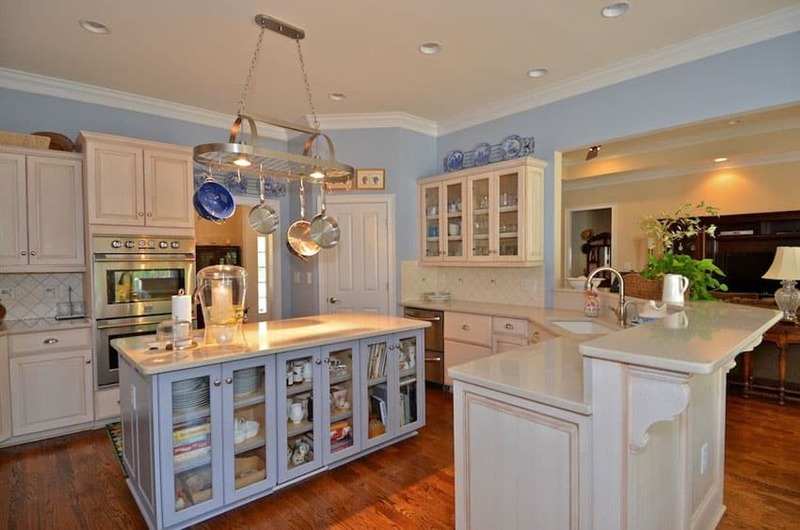 As a whole, the white paneled cabinetry and kitchen island contrasts with the heavy pot rack hanging over it. Warm maple wood floors tie the whole thing together and unite the differing hues of pale wood used for this kitchen.